Building Description: Mamaison Suite Hotel Pachtuv Palace Prague has 50 unique apartments, each one of them having a different lay out, view and decoration. Pachtuv Palace interior designer is Jane Wilson from RPW. Jane Wilson has revived the beauty of such landmark hotels such as The Dorchester in London. Among the architectural features offered are: antique wooden beams, frescos, vaulted chapel ceilings, sculptures, and fireplaces. All flats have been richly decorated with a harmonious blend of antique and modern furnishings, rugs and paintings. The size of suites varies from 35 sqm to 120 sqm, with an average apartment size of 67 sqm. Accommodation: Mamaison Suite Hotel Pachtuv Palace Prague has 50 unique rooms and suites each one of them having a different lay out, view or decoration. Among the features: antique wooden beams, frescos, vaulted chapel ceilings, sculptures, fireplaces, etc. All flats have been richly decorated with a harmonious blend of antique and modern furniture, rugs and paintings. The size of apartments varies from 30m2 to 120m2. 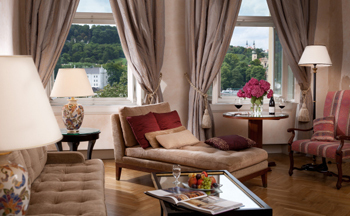 Location: Mamaison Suite Hotel Pachtuv Palace Prague is located on the Vltava river side, 200 meters from Charles Bridge and a 5 minute stroll to the Old Town Square. Most historic attractions are within walking distance, National Theatre, National Museum, National Opera, Charles Bridge, Old Town Square, Clementinum Library, Rudolfinum concert hall, Jewish Quarter, etc. Most major business centres are also located within 10 minutes drive. Approximately 13km from Ruzyne Airport, 4 km from the Main train station. Taxis, buses are available at the airport, and we will be very happy to arrange pick up for you with our hotel limousine. Mamaison Suite Hotel Pachtuv Palace Prague, the former residence of Earl Karel Pachta, is one cultural and architectural landmark of Prague. It is made of 2 different palaces, one baroque-style built around a superb 18th century courtyard, the other one classical, with apartments overlooking the river and Prague`s castle. Mamaison Suite Hotel Pachtuv Palace Prague was originally built in 1770 by architect Jan Josef Ulrch, for the Pachta family. It replaced a previous Palace that once belonged to the emperor Ferdinand II. It is typical of baroque architecture with its ornamental main gate, sculptured stairs and balconies. 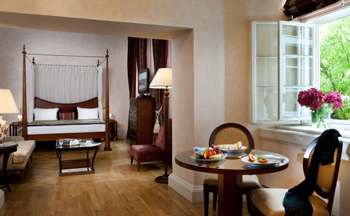 In the middle of the 19th century, a classical Palace, Jiraskuv, was built on the riverside and connected to Mamaison Suite Hotel Pachtuv Palace Prague. Pachtuv Palace is closely linked with the most famous names of music. Wolfgang Amadeus Mozart, a Prague fan, resided, composed and played there. He first came for a party and found himself “imprisoned” in a music salon for a few hours by Earl Pachta, who wanted his “Six Dances” order composed. In 1832, Wagner also resided in Pacthuv Palace. The palace has been renovated in 1994 as a residential building and then in 2003-2004 as a luxury serviced residence. 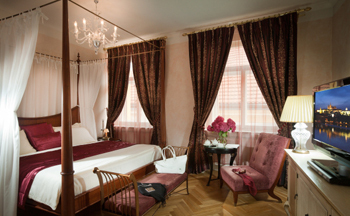 If you`re looking to live in Prague for an extended period of time, we suggest you to stay at Mamaison Suite Hotel Pachtuv Palace Prague for a comfortable stay. Move and Stay allows you to book easily a Prague apartment, whether you`re looking for a serviced apartment, an aparthotel, or a residential apartment for rent. Many of our Prague serviced apartments come with full accommodations, including a full kitchen and a lounge. In order to provide the most convenient service, Move and Stay helps you find 5 mintes by walk from charles bridge, prague apartments for rent with our easy-to-use apartment locator. Simply fill in the required information and search for your 5 mintes by walk from charles bridge, prague apartment.